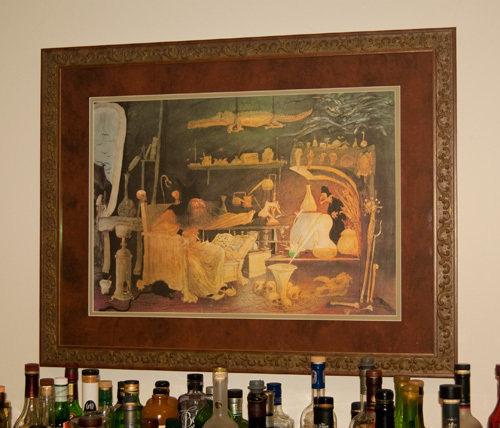 Above my home bar I have a framed print of The Alchemist by Ralph Steadman (you might have seen his work illustrating Hunter S. Thompson). 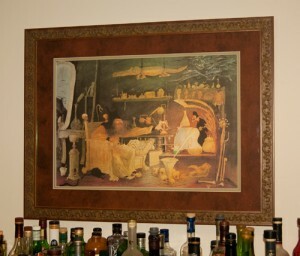 This is a bit of a happy accident as I bought the print before I was into cocktails and had it hanging before I had the bar set up. I have a bar set up not because I set out to do so, but because my small collection of bottles in the pantry multiplied and wore out their welcome from my wife, who doesn’t drink and therefore does not contribute to finishing off bottles. I began buying bottles of spirits and mixers in the first place to replace the wine I was consuming, since I thought at the time (hilariously so, now in retrospect) that it would be cheaper. But back to the alchemist. I love his tinkering. I love his collection of assorted ingredients and tools he has lining the walls. I love his anticipation of what effect dropping the mouse in might have on his potion (I have never used mice. Probably never will.). I love that this sits over my bar. It belongs there. Does this site belong, though? I do not intend to blog. I do not intend to write any recipe book reviews or discuss bars I have visited or drinks I have consumed, as excellent as they may be. This might be the most personal post I ever write, as I do not intend this as any sort of life journal. I have tried blogs before and have found that is not me. What I have found in the last year, though, is that I am making up my own concoctions more and more and desired any easy way to record these and share them with those who might be interested. Generally, my drinks have been thematically tied to a show I am performing in (and promoting through alcoholic beverage). Sometimes I have just picked up an interesting ingredient and am trying to make it work. For all of it, though, I am doing it just for fun. I am not a bartender, nor do I have such aspirations. I am not a mixologist, and shrink a bit at that term. I am not an expert by any means, and still learn so much as I go to different bars and read different manuals or attend events. I know just enough to be dangerous, as they say. I am an enthusiast (a dangerous one, I guess), and I like mixed drinks. So, I will dutifully record what I do, mostly cocktails, but sometimes some other creative production like posters I create for shows. If you are interested, check it out from time to time, and let me know what you think. After all, where else might you find a drink inspired by a musicalized American assassin, or based on a paint pigment used in a nineteenth century neoimpressionistic painting? And who knows, I might get around to using a mouse.